The simplest ham & cheese mini quiche recipe on the internet. Promise! This is my go-to recipe for entertaining, lunchboxes, picnics or anywhere an appetiser is required. Easy to make, easy to freeze, there is no excuse to always have some on hand. Lightly grease the patty pan trays with olive oil spray and set aside. Using a 6cm crinkle cookie cutter, cut circles from the puff pastry sheets. Press the pastry circles into the greased trays and set aside. If it is warm, place the trays in the fridge or freezer whilst you make the filling. To make the filling, combine the remainder of the ingredients in a large mixing bowl. Spoon a teaspoon of the filling into each of the unbaked pastry shells. Bake the filled trays for approximately 15 minutes, or until the mini quiches are puffed and golden in colour. Remove the trays from the oven and allow to sit for five minutes before removing the quiches to a wire rack. Serve hot, or allow to cool completely before freezing. 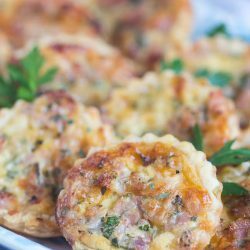 Cooked mini quiches can be kept in the fridge for up to three days. Freeze cooked quiches for up to three months. For best results, defrost the quiches completely before reheating. Rewarm the mini quiches at 150C (fan forced) for about 5 - 7 minutes.